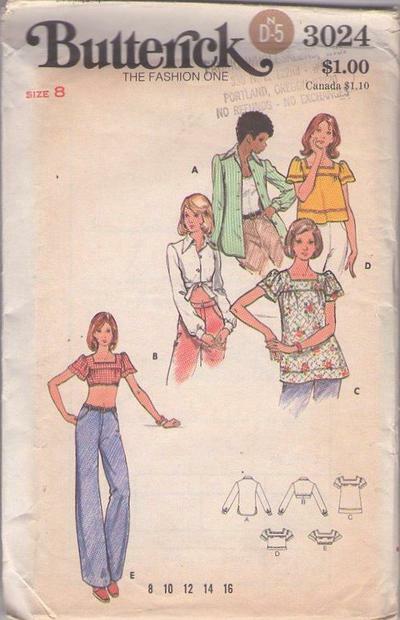 70s Casual, Retro Summer Clothing Patterns - Semi fitted shirt with shirttail hem or midriff band with ties has all in one pointed collar and band and full length sleeves slightly gathered into buttoned cuffs. With or without top stitch trim. Loose fitting smock top gathered into front and back yoke has square neckline and flared sleeves gathered at cap. With or without topstitching or purchased trim. View E has elastic at midriff. Purchased pants and T shirt.